The 3020 Series are compact 3U high precision PXI modular RF signal generators with an integrated dual-channel arbitrary waveform generator. Their functionality and performance are ideally matched to the needs of RF test systems for design verification and manufacturing up to 6 GHz. 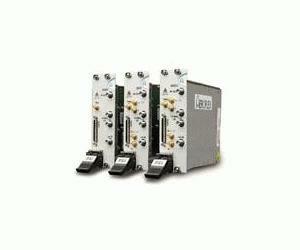 They provide RF output power control ranging from –120 dBm to +6 dBm with modulation bandwidths up to 90 MHz. The versatile 3020 Series PXI RF Signal Generator modules are designed for use together with a low noise, highly agile local oscillator input from the 3010 series RF Synthesizer module. The performance of the 3020 series RF signal generators makes them ideal for generating the complex modulated signals for digital radio communications test applications as well as basic AM and FM modulation and CW applications. Their excellent level accuracy, repeatability and switching speed make them an ideal choice for high-volume automated production test.